Back in the days of my misspent youth, one of my favorite arcade games was Vs. Excitebike, a side-scrolling motocross racing game based on launching a little 8-bit motorcycle off of various ramps while trying not to crash. 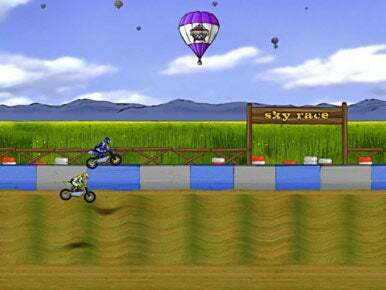 Playing Turborilla’s Mad Skills Motocross (free demo available) brought back fond memories of Vs. Excitebike—while clearly a different game, the basic premise is the same. From initial launch, it’s apparent that Mad Skills Motocross is going to have a lighthearted tone. The loading screens tell you the game is “generating awesome music,” “initiating flabbergasting features,” and (my favorite) “histomogrifying images.” After loading, you can start a new game, edit your own track, create profiles (for tracking a player’s career), and set video, audio, and controller preferences. There are five levels, with eight tracks per level, along with 12 bonus tracks. Within a level, finishing one track will unlock the next. To advance to the next level, though, you need to defeat the computer opponent on each track. (There’s also a time attack mode, where you just try to set fast time records on each track.) Occasionally, instead of winning a race, you’ll have to master a skill, such as performing a backflip. Once you’ve cleared all eight tracks on a given level, you move to the next level and repeat the process. You can also earn gold stars by performing tricks—flips and wheelies, etc.—during the race. The main objective is always to win the race; collecting stars is a bonus. Career completion, though, requires collecting all the gold stars, and that’s not necessarily easy. Wings on a bike! Power-ups add a twist to the game. There are five “power-ups” sprinkled throughout the game that add features to your bike—a set of wings to jump further, for example. Much of the challenge in Mad Skills Motocross is figuring out when and how to use the power-ups; the answer isn’t always obvious, nor is it as simple as watching when your computer-controlled opponent uses theirs. The game starts out simple, and get progressively more difficult as you advance. I could breeze right through some tracks, while others (I’m looking at you, “Sinks”) took many repeated efforts. While I did tire of a couple of the tracks after way too many attempts, the races themselves are short (usually one or two laps of 20 to 40 seconds), which makes it easy to try again. If you have trouble on a given track, a window will appear with a tip; heed those tips, as they can be very useful. Controls are basic—you can lean the rider forward or backward, and accelerate or brake the bike; one additional button activates the current power-up. You can use the keyboard, mouse, or a gamepad to play the game, but I strongly recommend using a gamepad with analog inputs. I started out on the keyboard, but found that many levels require the control you can only get from analog inputs. After switching to such a gamepad (a Saitek P880), those levels went from impossible to possible. 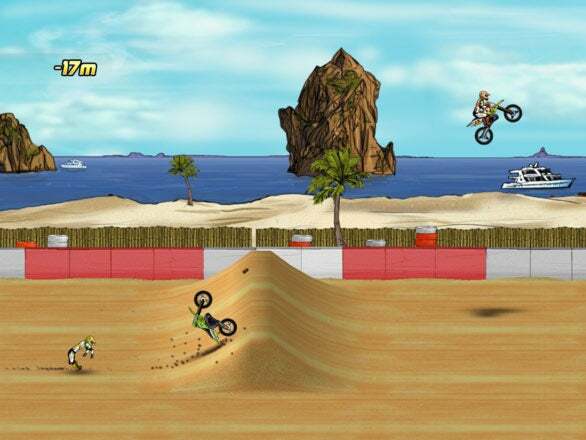 The graphics and audio in Mad Skills Motocross add greatly to the game’s enjoyment. While the soundtrack is acceptable, the sound effects are wonderful. From the rev of the motor to the various noises you’ll hear when crashing—grunts, cracking bones, and thuds—the sound effects really enhance the gameplay. The game also has an incredible physics engine that provides realistic-looking behavior to the bike and rider. The suspension compresses and expands, the rider leans fore and aft, and if you land wrong, you can break the bike—and your rider—in many interesting ways. When you crash, your rider goes flying, with limbs and body tumbling like a rag doll. It’s so entertaining that I’ll admit to crashing on purpose just to watch (and listen to) the outcome. Crashes result in tumbling of both bike and rider, complete with bone-jarring sound effects. The graphics are quite nice without being overly complicated, and they scale to your desired resolution—the game looked great in full-screen 1920x1200 on my 23” LCD. You can play in a window if you prefer, though I found that full-screen mode provided a better frame rate. I have only a few small complaints about the game. First, the game stores its files in a folder at the root level of your user’s folder, instead of in your Documents or Library folders. (I like things tidy, so I made the folder invisible, and it didn’t affect the game.) Second, the mouse cursor sometimes wouldn’t vanish when I started a race; tapping the mouse, though, always made the cursor vanish. Finally, while playing the program, its Dock icon is a generic black square, though you’ll only notice if you don’t play in full-screen mode. While the $25 price point is somewhat high for a casual game, with 40 tracks and challenges to work through, there’s enough content to keep you busy for a long time. I say that from experience, as I’m still progressing through the game, despite many late night sessions on the track. If you’re looking for a fun, easy-to-play yet challenging-to-master casual game, Mad Skills Motocross is well worth a look.